The last train pulled out of the Michigan Central Station in 1988, shortly before the Honda Accord became the best-selling car in America, a humbling milestone for the city and its top industry. 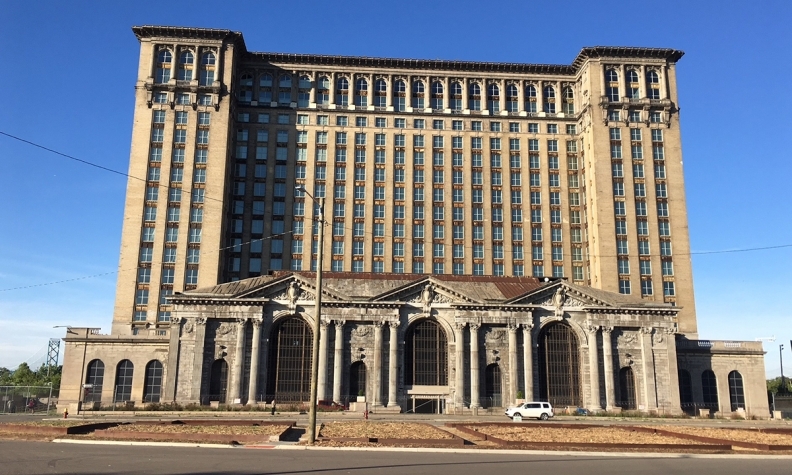 DETROIT -- Ford Motor Co. has purchased the long-blighted Michigan Central Station, a towering train depot in Detroit’s Corktown neighborhood that will be the centerpiece of a sprawling urban campus the automaker will use to woo talent. Matthew Moroun, whose family has owned the 104-year-old train station for years, confirmed Monday the sale to Ford. Following the Moroun’s announcement, Ford said it will unveil its plans for the building at 11 a.m. on June 19 in what it calls "the start of a new era of innovation and mobility." The Moroun family has been in talks with Ford representatives since Oct. 13, Moroun told Crain’s Detroit. He said the company’s iconic Blue Oval logo will adorn the building. It's unclear what the automaker plans to do in Corktown, although last month it moved roughly 200 workers on its autonomous and electrified vehicle teams into a building known as The Factory. When Ford purchased The Factory late last year, executives said forging operations in Detroit would help the company battle Silicon Valley for young, tech-minded talent to develop and build self-driving vehicles. Ford has deep roots in Detroit: Henry Ford's Piquette Avenue Plant, which first cranked out the Model T, resides on the city's east side, and Ford once owned the city's towering Renaissance Center, before rival General Motors purchased it and established its headquarters there. Corktown — an area Ford Executive Chairman Bill Ford says he holds especially dear because its settlers emigrated from the same region of Ireland as his ancestors — would serve as a hip urban work environment that's starkly different from the automaker's Dearborn offices and product development operations. "The reason I fell in love with the place as soon as I saw it is it really gives you that vibe of the heritage and the new coming together — and it really brings it to life," Sherif Marakby, Ford's head of autonomous and electrified vehicles, told Crain's Detroit Business in January about The Factory. "We see being in Corktown as a big advantage. And it has actually, in many ways, increased the interest in working on the team — internally and externally." Ford is expected to also buy roughly 50 additional properties in the area ranging from parking lots to abandoned buildings. The automaker is also in the midst of an extensive renovation of its Dearborn campus. In April 2016, Ford unveiled plans to transform the longtime campus at an estimated cost of as much as $1.2 billion. Among the goals is to centralize more employees, doubling the number of people who work there to about 24,000. A second phase of the plan includes major renovations of the Ford World Headquarters complex, including Ford Motor Credit Co. It's unclear how, if at all, Ford's Dearborn plans would be affected by the purchase of the train station. Real estate and construction experts have said a redevelopment of the train station alone is certain to cost at least $300 million; any redevelopment would likely seek millions in tax incentives. Chad Livengood and Kirk Pinho of Crain's Detroit Business contributed to this report.